Here at Adorama we're winding down from another great PhotoPlus show in NYC. As always. it was terrific to meet so many of you that stopped by the booth to say "Hey" and to take advantage of the "Specials" that we were running. The Javits Center was jammed, wall-to-wall people seeing the latest & greatest in our world of Photography. In all the years that I've worked PhotoPlus, I cannot remember seeing the Nikon & Canon booths overflowing with attendees. With speakers such as Vincent Laforet, Joe McNally, Cliff Maunter, Moose Peterson, and Ron Magill (Who was so excited to bring an 8 week old Leopard up on stage) plus so many more, how could you go wrong...The place was buzzing with excitement! Besides the excitement surrounding the impending release of Canon's NEW EOS5D Mark II Camera, Canon announced a new "Instant rebate" program for many lenses and Flashes. Now is the time to save some $$ on the Canon lenses you've been longing for. Nikon's new Coolpix S60 is very very cool. It has a "Touch Panel LCD" that offers 160 degree viewing, and controls the camera too. In six colors, this is sure to be a big hit this holiday season. 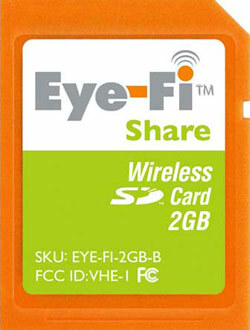 Eye-Fi gives you the ability to upload photos automatically from your digital camera to your computer and favorite photo site with the world's first wireless memory card. These cards are becoming more & more popular as time goes on! ADORAMAPIX.com has now partnered with Eye-Fi to make it easier for you to upload and print your images. Get 50 FREE 4x6 prints with your 1st AdoramaPix.com upload! GPS Trackers for your Camera? Yes, Now you can Geo-Tag your images so that you will know the exact location that it was taken. F or example, when used with Google software Picasa2, Google Earth, or Google Maps, your photos will be shown on an online map, giving you a whole new way to organize, enjoy and share your pictures. Share your pictures and trip route with your friends and family. More importantly, never forget where you took a picture again. You can also use your GPS tagged photos in a compatible GPS navigation system, allowing for features such as choosing your destination and landmarks visually. Here are a few GPS Trackers for your cameras...Start thinking Holiday gifts...Now's the time! GiSTEQ CD110BT Bluetooth GPS Digital PhotoTracker, for Digital Cameras with NEMERIX Low Power Chipset "MAC COMPATIBLE"
GiSTEQ CD111PRO PhotoTracker Device with Windows Software - Compatible with Adobe (MAC COMPATIBLE"
GiSTEQ GPS Digital PhotoTrackr Lite, for Digital Cameras with Software "MAC COMPATIBLE"
New Camera cases from ThinkTank, Tenba, Lowe-Pro, Tenba, KATA, Domke, Lightware, Tamrac, Mountainsmith, Pelican, Shootsac, Jill.E, plus about 20 other manufacturers are always in stock now. The Basic Shootsac is designed to be WORN comfortably like an article of clothing WHILE you shoot. Use your "traditional" camera bag to transport your gear - load up your Shootsac for active shooting. With 3 easy access lens pockets and 3 safety snap pockets this revolutionary lens bag will change the way you shoot. Keep your favorite lenses, compact flash cards, batteries, cell phone and other shooting necessities within arms reach instead of in your gear bag. The bag is made of wetsuit grade neoprene that gently wraps your lenses in individual protective pockets, keeping them safe from scratches and bumps while also conforming to your body. See you all next month...In the meantime, if you have any questions whatsoever, fell free to contact me directly anytime.